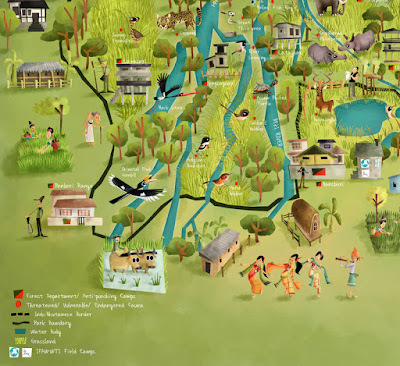 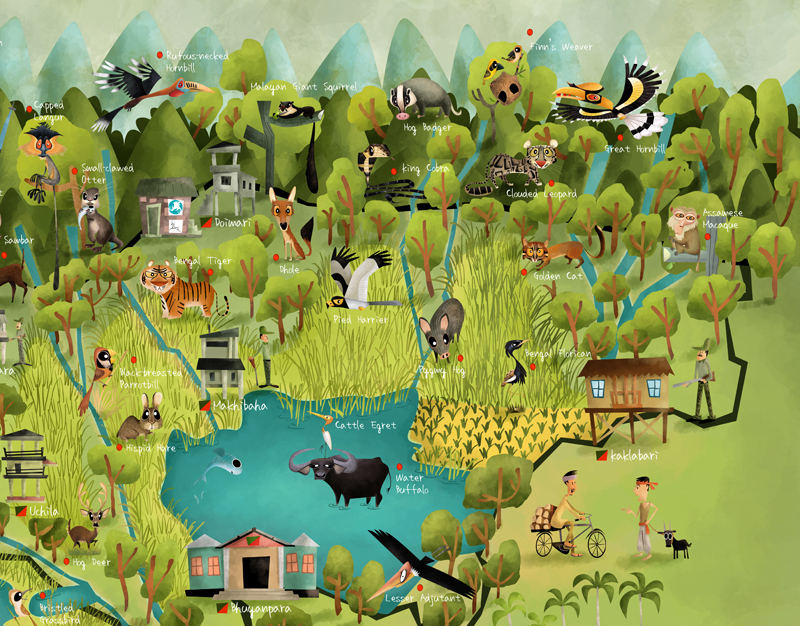 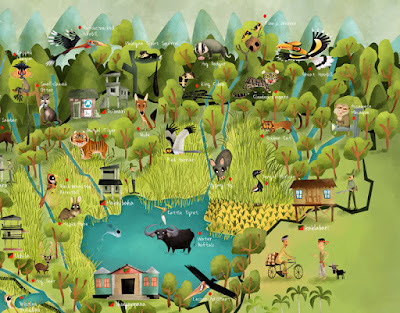 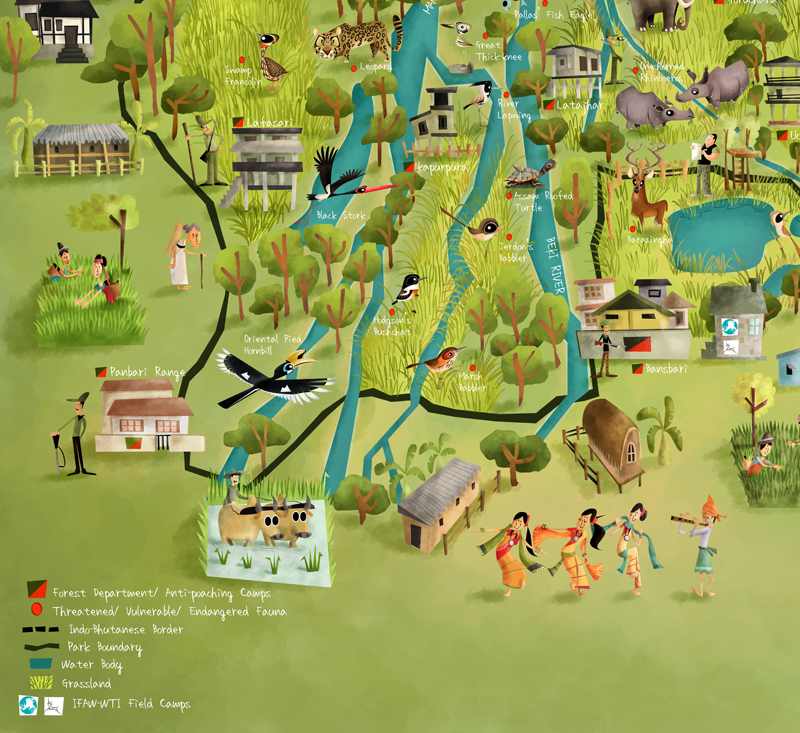 I'm delighted to bring to you the second in the series of my illustrated maps on biodiversity hotspots- an illustrated map of Manas National Park. 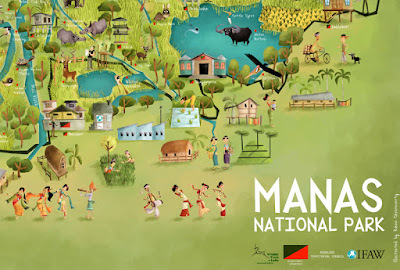 Manas is situated in Assam, India, and is home to some of the world's rarest and most endangered wildlife such as the Bengal Florican, the Golden Langur, the Pygmy Hog and the Hispid Hare. 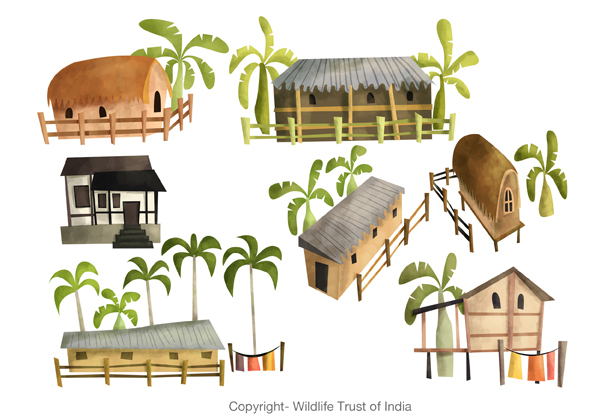 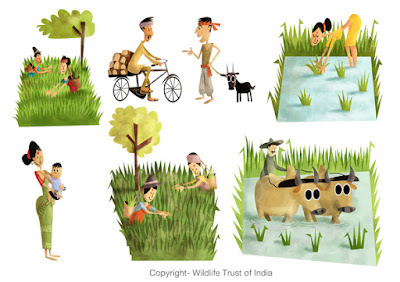 The project was commissioned by the Wildlife Trust of India. 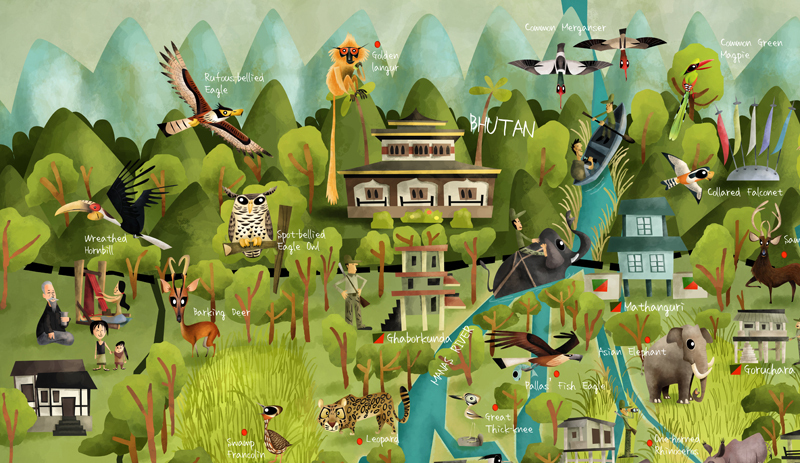 The Golden Langur, that occurs east of the Manas River is listed as Endangered on the IUCN. 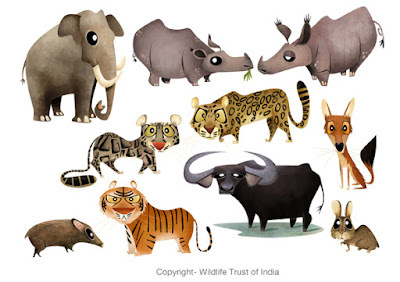 Several endangered/ threatened animals in one frame- the Water Buffalo, the Pygmy Hog, the Bengal Florican, the Hispid Hare, the Black-breasted Parrotbill, the Tiger, the Hog Deer, the Rufous-necked Hornbill, the Capped Langur and the Assamese Macaque. 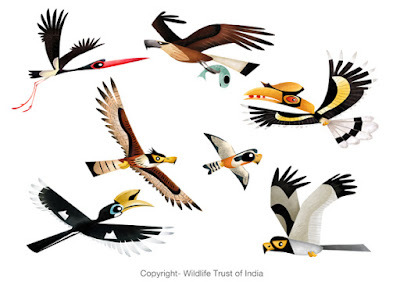 Some of the birds in flight. Seen here are the Black Stork, the Pallas' Fish Eagle, the Great Hornbill, the Rufous-bellied Eagle, the Collared Falconet, the Pied Harrier and the Oriental Pied Hornbill. Mammal life of the park is one of the most diverse in India, right from elephants to Pygmy Hogs. Also seen here are Purabi and Doimala- two orphaned rhino calves being hand-raised by WTI, and the Leopard, the Clouded Leopard, the Dhole, the Water Buffalo and the Hispid Hare. 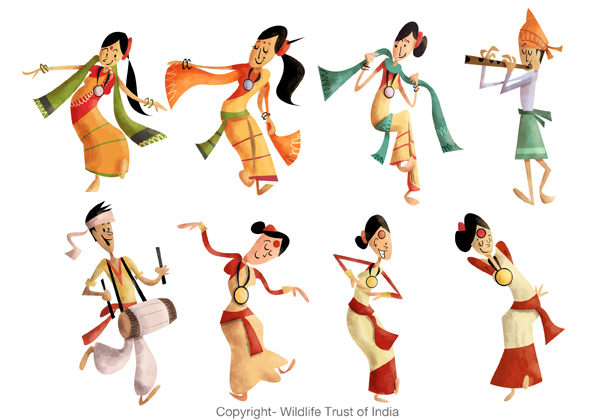 The forest staff of Manas. 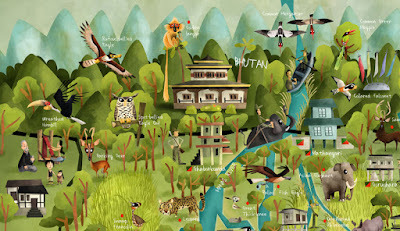 Field stations and anti-poaching camps, along with the Royal Palace of the Bhutanese King, in Royal Manas National Park. 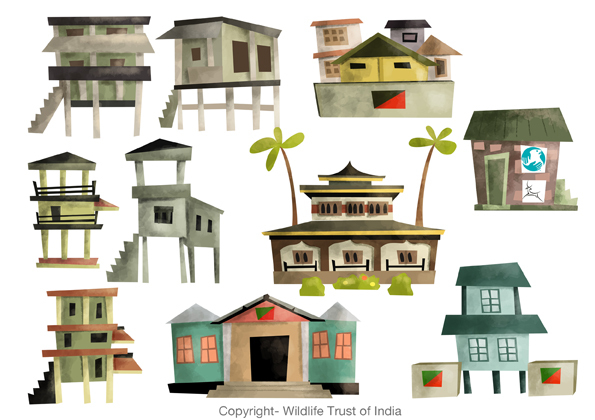 Some houses on the map. The stilts are an indispensable feature in flood-prone areas in this part of the country. 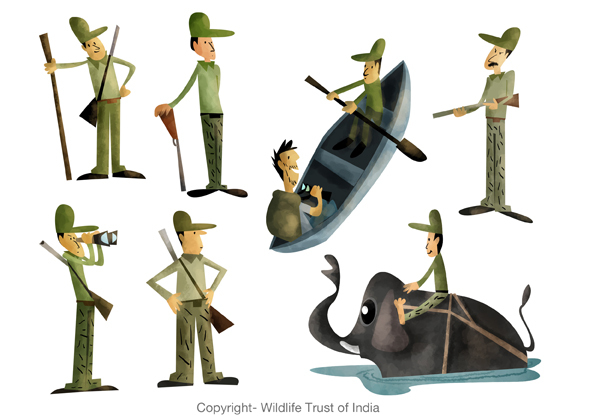 Also seen here is Dr. Bhaskar Chowdhry, chief veterinarian at the WTI field camp in Bansbari, Manas, who supervises the rhino and Swamp Deer enclosures. Bodo and Assamese dancers and musicians. A huge thanks to Dr. Sonali Ghosh, Deputy Director of Manas National Park for hosting me and showing me around, and to Ms. Rupa Gandhi and the WTI team for taking the project under their wing! The map is scheduled to be released soon, in and around Manas as an awareness initiative along with an additional poster on the endangered and threatened fauna of Manas. 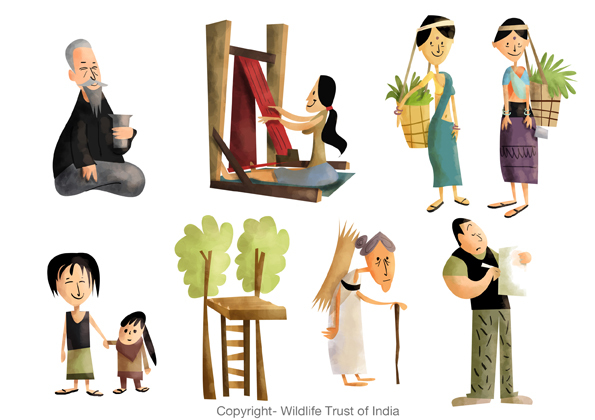 Copyrights to all images belong to WTI.